The 540 Sundancer is not new to the Sea Ray line-up but it was the largest Sea Ray at this year’s Toronto International Boat Show and most worthy of the enormous crowds of attention and admiration it received. 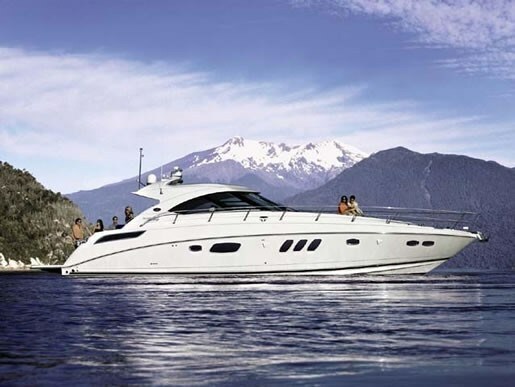 It epitomizes all that is Sea Ray and all that the Sundancer name has been for decades to this, the perennially largest pleasure boat builder in the world. And for 2011, Sea Ray offers an enormous diversity of forty different models in four series from seventeen to sixty-one feet. It is next to impossible to do justice, in a few short paragraphs, to the pages-long listings of standard equipment on the 540, let alone to provide a comprehensive appreciation for the outstanding workmanship, attention to the finest of detail, and a feeling for the luxurious surroundings and amenities that present themselves throughout this gorgeous yacht. The cockpit and swim platform together extend almost half the total of the 540’s over fifty-four feet in length overall and provides luxurious seating for more than you would normally ever want to have on board at any one time. This is entertaining at its finest with a gigantic L-shaped, portside rear lounge, the stern portion of which converts to an intimate sunlounge. A starboard side lounge faces the twin helm pedestal “chairs” which themselves come with armrests, teak footrests, and reclining backrests and which together can swivel 180° to face the side lounger or the cockpit aft. The permanent hardtop roof has a retractable sunroof and the cockpit has its own zone-controlled reverse-cycle air conditioning/heating, wet bar, table, and dedicated Sony® sound system. The salon below is opulence personified with its high gloss solid wood cabinetry, moveable high gloss wood surface dining table, Ultraleather® sofa with pullout bed, 32” flatscreen LCD HDTV, Bose® home theatre, and another complete sound system. The portside galley is of course fully equipped with a two burner electric stove, microwave/convection oven, lots of solid counter surface, and under-counter separate refrigerator and freezer units. A separate zone-controlled reverse-cycle air conditioning/heating system keeps the 540’s interior precisely as comfortable as you please. The aft full-beam master stateroom features a full size queen bed complete with coordinated linens, its own home entertainment system with another 32” flatscreen LCD TV, and a private head compartment with separate stand-up shower, all with tile flooring. The forward stateroom has a queen-size island style bed, again with coordinated linens, and its own entertainment system with 19” flatscreen LCD TV. The forward head also has a separate shower and full tile flooring. If two staterooms are not enough, a three stateroom optional layout is available for the 540 Sundancer. There are two choices of twin diesel Zeus drive propulsion systems available for the 540; the standard being twin 576 hp Zeus Cummins MerCruiser units. 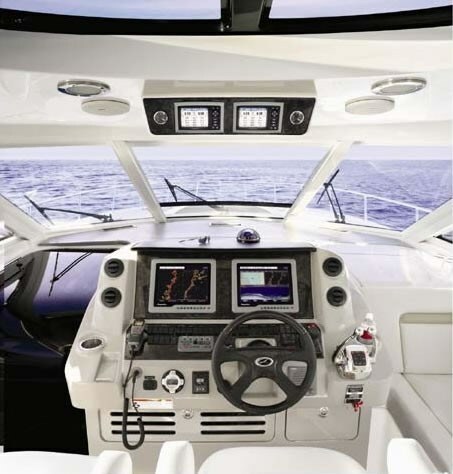 SmartCraft® DTS (Digital Throttle and Shift) w/Skyhook® and Zeus® joystick control is standard as are dual SmartCraft VesselView displays which provide an almost mindboggling array of instant engine condition monitoring, vessel systems information, and navigational assistance. Standard electronics include a full complement of large colour screen integrated Raymarine® GPS, radar, and chartplotter instrumentation as well as VHF plus an autopilot integrated with the Zeus drives. A standard 21.5 kW Onan® diesel generator with sound shield, of course, is sufficient to keep all on board systems functional when under way. Aside from personal choices of aesthetic upgrades such as a custom set of china, or custom fabrics or flooring, some options you may wish to consider would be a washer/dryer combo, central vac, additional electronics such as engine room cameras, or a thermal imaging camera, or a DSS satellite TV system, and perhaps most importantly, a hydraulic Marine Lift swim platform with or without the Mercury® Amanzi™ tender package with 30hp Four-Stroke outboard motor. Sea Ray’s 540 Sundancer is without a doubt one of the finest expressions of all a mid-cabin express cruiser could be and should be. And with its unusually deep, for a boat this size, 21° deadrise deep-vee hull and fully integrated fibreglass stringer system, the 540 Sundancer is not only fabulous to look at and luxuriously pampering on board, it is designed and built to tackle almost any water you would want to explore in it. You just can’t get much better than that.